Before we begin, please have your ears—and your internet—ready. It’s my very first Read-It-Hear-It-Then-Read-It-Some-More story! You will see links at various intervals for pausing and listening. This isn’t required, but your enjoyment of the following audio-rich saga will be enhanced. Thank you. Here’s the story of my role in Cincinnati’s most famous, and most ridiculous, conspiracy. It began with radio commercials that seemed real, became something of a local craze, but were ultimately exposed as fictitious. Then, surprisingly, the false commercials continued as if this was all OK. Law enforcement did nothing. Nobody was punished, or even sued. The perpetrators—I was one—got away with everything. 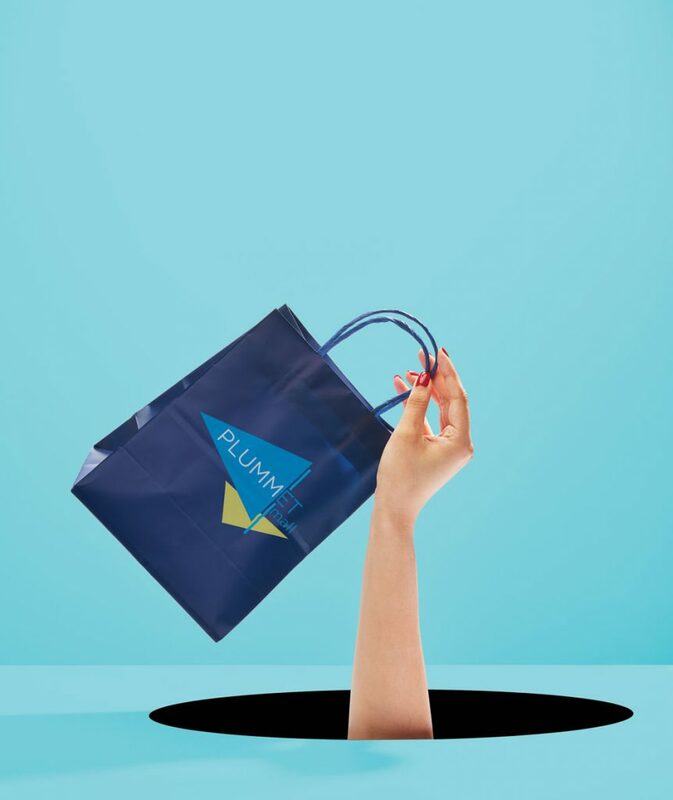 This is the inside story of Plummet Mall, the world’s first successfully fraudulent ad campaign, born right here in Cincinnati in 1985. I coined that name, wrote the scripts, and directed the recording sessions. Ad executive Jerry Galvin, in service to an invisible client, orchestrated the whole project. No consumers were harmed. Do not attempt. Jerry and I then rode this tiger into a multi-city franchise, a Plummet Mall Universe that appeared across America over a three-year period. The sequels, however, were not Plummet Mall ads. The wide publicity after each successful campaign meant that we had to invent a fresh fake product each time. We also walked away scot-free each time. But, hey, let’s start at the beginning. Let’s visit Cincinnati during the winter of 1985 and catch up on what was happening as Jerry and I prepared to attack. Not everyone believed what they heard. Fans of WEBN, where fake commercials were baked into the station’s image, assumed it was just another prank. But then they heard the same ad between the Sheena Easton and Air Supply songs on Q102. And during a talk show on WLW. And after promos for the Super Bowl on WCKY. The spot was on almost every station in town. Even skeptics started thinking this thing could be real. Well, it was. The commercial did advertise a real product, but it wasn’t a shopping mall—it was radio itself. Plummet Mall was an ad campaign from the Greater Cincinnati Broadcasters Association to demonstrate the power of radio as an advertising medium. The name recognition surveys, conducted after the campaign ended, proved it. Feel free here to start complaining. You’d be far from the first. After we came clean, slings and arrows flew everywhere. You bastards! You cheated! Of course people will remember something so preposterous! Hey, why not advertise classes that teach people how to perform intestinal surgery on themselves? They’d remember that! By the way, the campaign’s original concept was this: Classes that teach people how to perform intestinal surgery on themselves. When Jerry Galvin first talked with the Broadcasters Association, he proposed commercials for a course that saves big bucks on medical bills by showing you how to perform surgery on your own body, right at home! The course was called Suture Self. Not everyone loved the idea, but it was approved. Jerry then called me. Alongside my career in radio, I’ve created countless commercials and jingles, many with him. I’m forever grateful that he asked me to help with this historic project. But soon after we began, Jerry called again, worried. He’d just watched an HBO comedy special featuring a sketch about self-surgery, even using the same name. Oh, crap. Now what? Reaction was instant and explosive, confirming a profound Biblical teaching: we are all tiny, selfish creatures driven by fear, anger, and greed. Here I must pause and salute Japan’s Mitsubishi Corporation. I’d read that it was nearing completion of the world’s first practical spiral escalator, and that rekindled an idea I’d had years before: a radio comedy series featuring the stores in an underground, vertically-built shopping mall. How about that for our campaign? Jerry said yes, and convinced the Broadcasters Association to change gears. Plummet Mall got the green light. Secrecy was everything. Only the manager at each station knew. The announcer was recruited from another city. I recorded him at night and gave the finished tapes to Jerry. His agency sent them to radio stations as “insertion orders,” which are automatic media buys that bypass human interaction. At sunrise on January 14, Plummet Mall commercials began airing on 17 Cincinnati stations. Reaction was instant and explosive, confirming a profound Biblical teaching: We are all tiny, selfish creatures driven by fear, anger, and greed. Fear came first, with calls to Jerry’s agency by TV and newspaper sales reps. Plummet Mall hasn’t advertised with us! Please, tell us it’s not too late! Anger came next, from local utilities. We were not notified! Where are the applications for electric, water, sewer? Who the hell is in charge over there? Then, of course, greed. Hi, I’m with Muzak. That new mall needs some piped-in music to inspire shoppers! Hello, have you guys hired anybody for waste disposal? That vertical thing, that’s a big job, just right for us! Radio station switchboards, now under bombardment, referred all questions to Jerry’s ad agency, where everyone was told to direct the inquiries straight to him. That is, straight to his voicemail. Calls also hammered the Greater Cincinnati Chamber of Commerce, where their Vice President of Communications was completely blindsided. Let us take pity on that pathetic victim: Robin Galvin, wife of Jerry Galvin. He’d mentioned something to her about a strange new mall, but it hadn’t really registered with her. As for me, I’d wiped my fingerprints off of everything and was just whistling in the corner. The whole city was buzzing over Plummet Mall, but nobody was getting answers, just more commercials. Jerry and I enjoyed the hysteria. Still, we were worried about the final spot, which didn’t exist. It definitely would not contain a full confession—the upcoming press conference was for that—but we had yet to write a satisfying last act. Week 3 was underway, stations needed new tapes for Week 4, and we had nothing. Dear God, what do we do now? Most people knew by this time that Plummet Mall was bogus, but they didn’t know why. When we eventually revealed the whole truth, people got angry. Many hoped we’d all be sued into oblivion or, even better, prosecuted. Why didn’t that happen? Hadn’t we committed fraud? No, because Plummet Mall offered nothing to buy and nowhere to go. In fact, the only thing the spots asked listeners to do—the “call to action,” as they say in the ad biz—was this: Keep listening to your radio for more details! The real sales pitch was hiding in plain sight. After it was all over, radio groups in other cities tried copying what we’d done. Unfortunately, not every copycat campaign succeeded. In 1986 in Portland, Oregon, local radio stations announced the “Stardrive 2000,” a new automobile requiring no gasoline or servicing for 200,000 miles! The spots said the car would arrive at “a dealer near you” in about two weeks. Oops. That’s a clear invitation to delay buying a real car, which means lost income for a real dealership, which means—let’s all say it together—fraud. Oregon’s Attorney General threatened to fine every radio station $25,000 per commercial if they continued. Everyone knew this guy was bogus by the third week, but the campaign’s true purpose was still a mystery, and several theories made the rounds. Jerry mentioned this one to me: Maybe Jene Genkins is a new radio morning host, and this is one station’s plot to trick all the other stations into promoting him unknowingly. Damn, I replied, we’ve gotta do that someday! Welcome to Denver, Colorado, 1988. It’s January, and the Broncos are once again contenders for the Super Bowl. There’s extra excitement over at KOAQ-FM, which is about to launch a new morning team. A dummy ad agency purchases commercial time and delivers tapes to seven Denver radio stations to promote a breakfast cereal called “Morning Flakes,” but that’s actually the name of KOAQ’s new show. Those stations are about to promote their worst enemy. The second spot never aired, because we were outed after just two days. We didn’t care. The press coverage was massive. It was a triumphant concluding chapter to the Plummet Mall saga. Thank you for perusing our Read-It-Hear-It-Then-Read-It-Some-More story. If you were offended, please accept my deep and sincere hope that you will someday learn how to take a joke. OK, I do apologize to Robin Galvin. I assume she has forgiven Jerry, because they’re still married. Events like Plummet Mall and its children will never happen again on the radio. It isn’t just because the medium has changed; the whole world has. Do you think the secrecy that’s required for stuff like this would hold together today? What about the digital underpinnings of the obligatory Plummet Mall website, which are easily traced? And Jene Genkins couldn’t even get on the air without first submitting disclosure forms following the money. Morning Flakes? Hmm, something like that might still work. Watch out, America.